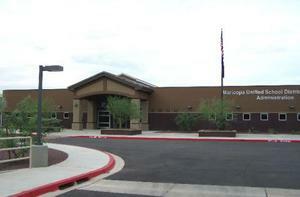 Maricopa Unified School District’s governing board will meet tonight, beginning with a study session at 5 p.m. and followed by the regular meeting at 6 p.m. The study session will focus on Sections A through LH of the governing board’s policies, which were recently reviewed by the board. Modifications to those policies will be discussed during the study session. In addition to the approval of vouchers, donations, travel and the personnel schedule, which includes new employees, resignations and leave of absence and stipend requests, governing board members will be discussing board-meeting presentations. The focus will be on determining the types of presentations desired, the frequency of district, committee and student council updates and time limits for those presentations. Presentations scheduled for this meeting include the Pinal County Education Service Agency Annual School District Report and Race to the Top grant availability. Business Director Aron Rausch will review both the monthly financial report and utility tax revenues. Board members are also slated to approve district hearing officers for student expulsions and the open enrollment capacity for all schools in the district. Click here for the complete agendas. When: Tonight, Jan. 27; study session at 5 p.m. and regular meeting at 6 p.m.
Where: District Office Administration Building, 44150 W. Maricopa-Casa Grande Hwy.